The five people killed by AK-47 gunfire from military police at a protest along Pur Senchey district’s Veng Sreng Street on Friday were all striking garment factory workers, a union official confirmed Sunday. 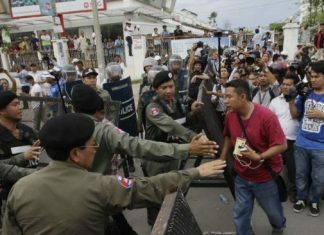 Military police officers opened fire on the factory-lined street on Friday morning during clashes with striking workers armed with sticks, stones and Molotov cocktails, killing five men and injuring at least 30 people. An investigating team from the independent Coalition of Cambodian Apparel Workers’ Democratic Union (CCAWDU) has since identified the five confirmed killed by military police as garment factory workers, CCAWDU legal officer Oum Visal said. Mr. Visal added that 35 other garment factory workers, as well as two students, had also been identified by CCAWDU in its rounds of three Phnom Penh hospitals as having been injured on Veng Sreng Street. The hospitals surveyed by CCAWDU, which Mr. Visal said will release the full findings of its investigation today, were the Khmer-Soviet Friendship Hospital, Calmette Hospital and Preah Kossamak Hospital. Ho Vann, a CNRP lawmaker-elect for Phnom Penh, said the opposition party’s own investigations had confirmed that the five dead were all striking workers and that three were shot at Canadia Industrial Park. He said four of the dead—Kim Phalin, 29, Yann Rithy, 26, Sreng Vibol, 22, and Ouk Pheak, 23—had been taken to the mortuary of the Khmer-Soviet Friendship Hospital, while the fifth—Sam Ravy, 26—had been brought to the mortuary at Preah Kossamak. At the Khmer-Soviet Friendship Hospital Sunday, 28-year-old garment worker Khar Srey Oun said had been rushing home to avoid the violence when she was shot by an AK-47 round above her left knee. “I am pregnant so I was moving quickly to get home to try to avoid it all, but I could not,” she said. But Noeun, 25, said he had been taking part in the clashes with police, but said he had only been armed with a stick when he was shot through his left ankle. “I was about 20 meters from the military police when they started shooting upward, sideways and at people’s legs,” he said, adding that his wage as a garment worker was not enough to cover hospital bills.